Today is Remembrance Day in Canada. It is a day to remember the sacrifice that so many have made for the freedoms that so many of us have. On this day, we honour all those who have served in the military–in World War One, World War Two, and The Korean War, who sacrificed their lives, their limbs, and those who continue to serve. I thought it fitting to review a book set during the Second World War today. The Orphan’s Tale is a reminder of what our veterans fought for. Synopsis: The Nightingale meets Water for Elephants in this powerful novel of friendship and sacrifice, set in a traveling circus during World War II, by international bestselling author Pam Jenoff. Seventeen-year-old Noa has been cast out in disgrace after becoming pregnant by a Nazi soldier during the occupation of her native Holland. Heartbroken over the loss of the baby she was forced to give up for adoption, she lives above a small German rail station, which she cleans in order to earn her keep. When Noa discovers a boxcar containing dozens of Jewish infants, unknown children ripped from their parents and headed for a concentration camp, she is reminded of the baby that was taken from her. 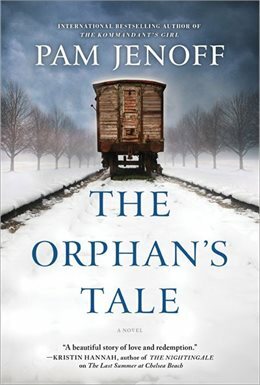 In a moment that will change the course of her life, she steals one of the babies and flees into the snowy night, where she is rescued by a German circus. The circus owner offers to teach Noa the flying trapeze act so she can blend in undetected, spurning the resentment of the lead aerialist, Astrid. At first rivals, Noa and Astrid soon forge a powerful bond. But as the facade that protects them proves increasingly tenuous, Noa and Astrid must decide whether their unlikely friendship is enough to save one another—or if the secrets that burn between them will destroy everything. A heart-wrenching historical novel about friendship, love, and the power of humanity. All set in a travelling circus trying to make ends meet during WWII. I took all of three notes while reading The Orphan’s Tale. That’s it. Do you want to know what they were? Page 24 – I’m crying. On public transit. Thanks book. Page 31 – I just realized this book is written in present tense! It works! Page 77 – Why are women so hard on each other? This is one of the reasons why I’m giving this book five stars. It grabbed my attention and held it so strongly that I didn’t write notes. Other reasons why I’m giving it five stars? The setting was both familiar and new at the same time. I’ve read a lot of books set during the second world war. I enjoy reading about that time in history. There were some wonderful things about it, despite the darkness of that era. But with the circus and the trapeze act – it added a whole new dynamic. It was incredibly interesting to imagine what the tent looked like, what the apparatus was like, what the relationships between the staff and performers was, and what the train and bunks and backstage areas looked like and felt like. It was also heartbreaking to experience the fear and the loss that these characters felt. Some were being hunted because of their cultural background. Some were running from circumstances outside of their control. Some were looking for hope and family. Some were losing hope after losing family. This story was about friendship and family – and the heartache and joy that comes with them. Noa and Astrid come from different worlds, and yet have experiences the deepest and harshest kinds of loss and rejection. Watching their friendship develop was beautiful. It made me miss my own closest friends. I’ll be honest, at time Noa really, really annoyed me. She felt whiny and stupid and reckless. I forgot at times that she was just a teenage girl. Her recklessness and complaints make sense. She was a teenager who was forced into a new world, with new rules. Of course there would be some pushback. But Astrid, I loved her. She was stubborn and rude and powerful. She was fighting in the only way she knew how, despite horrible circumstances. The book starts with a prologue of an unnamed woman looking at a museum display. It ends in that same place and reveals who she is and how she got there. The finale wrapped everything up beautifully. Not an easy read. But so incredibly worth it. It is painful. At times, it is violent. It is tearful. (I cried more than once while on my daily commute.) But it is worth it. It is written in an engaging and personal tone. I enjoyed the dual point of view and felt it really added to the experience and the intimacy of the story. Noa and Astrid’s stories are hard. But I think they are a truthful representation of what many went through during those years. Do you think you’d enjoy The Orphan’s Tale? Ohh nooooo, another 2017 release! And with such a high rating I’m really crossing my fingers hard for that giveaway. This sounds so beautiful and heart breaking and wonderful, I wish I could go pick it up right now! It’s AMAZING. You need to read it. It will break you. But it will put you back together again.